Download "CSI NIGHT. 1. Set a date: Give yourself at least four months of planning/preparation time." 1 CSI NIGHT Background: Statistics show that parental involvement in education decreases as children age. 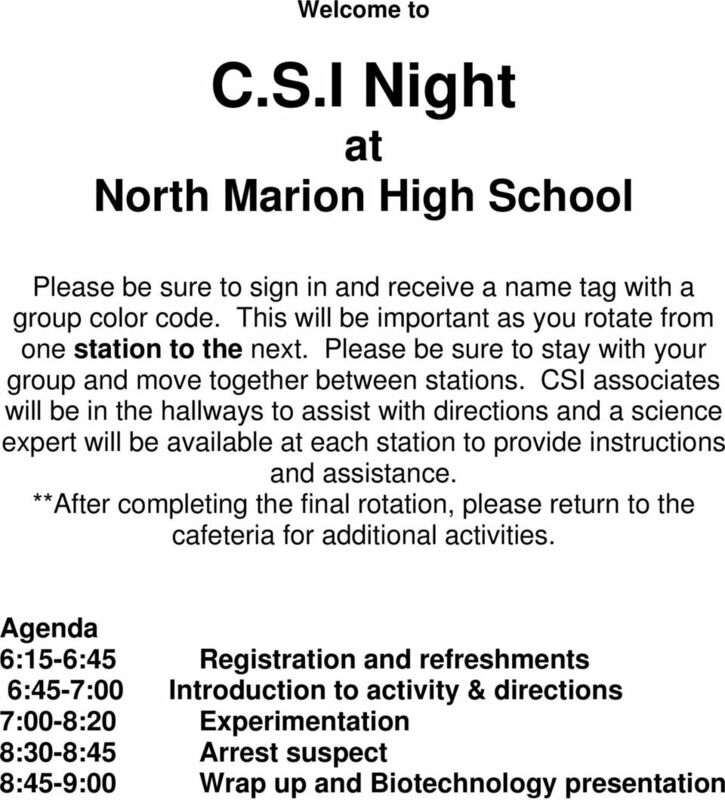 One way that we work to bring parents back into the classroom with their child is through our annual CSI Night. 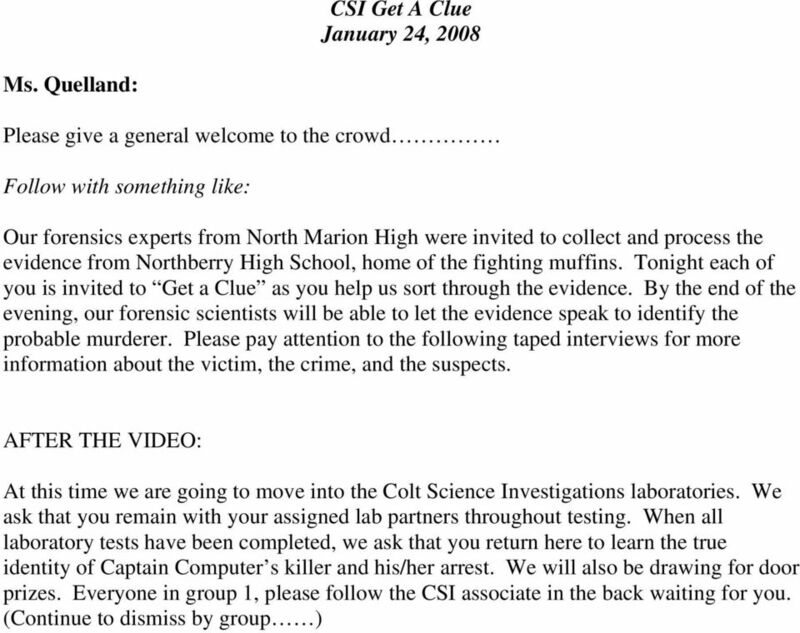 (We use the acronym to stand for Colt Science Investigator.) 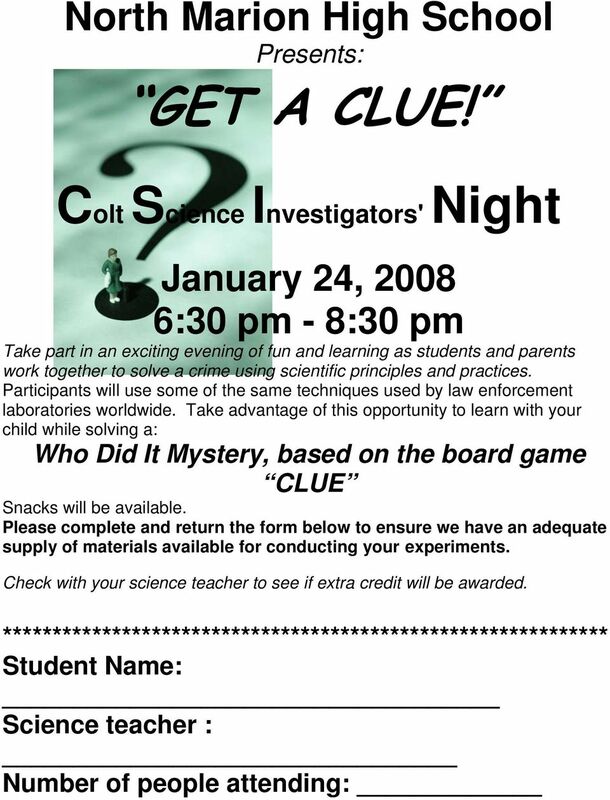 At the CSI Night event, parents and students work as a forensic team to conduct experiments using various scientific techniques and equipment, then analyze the data collected to solve a crime. Not only do parents get involved, students exhibit an increased interest in science! The event can be scheduled along with a meal if you have sufficient manpower and resources. Participants gather in a large room or auditorium to receive basic information regarding the crime. 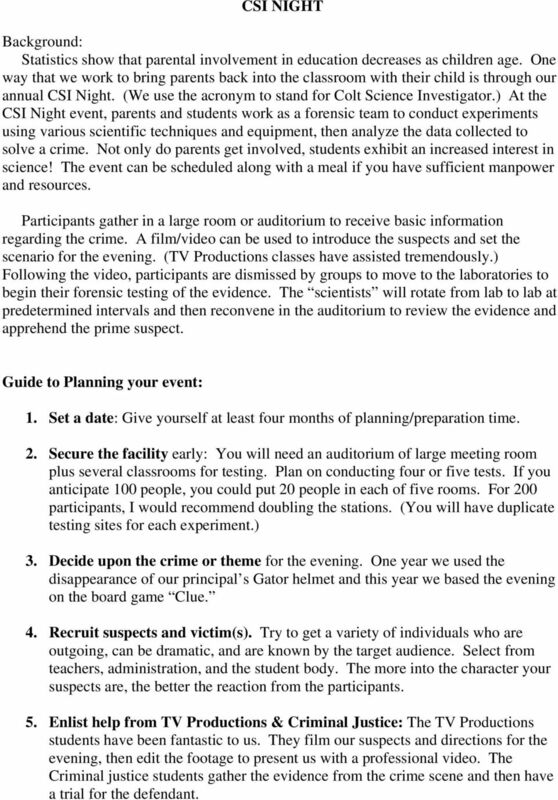 A film/video can be used to introduce the suspects and set the scenario for the evening. (TV Productions classes have assisted tremendously.) Following the video, participants are dismissed by groups to move to the laboratories to begin their forensic testing of the evidence. The scientists will rotate from lab to lab at predetermined intervals and then reconvene in the auditorium to review the evidence and apprehend the prime suspect. Guide to Planning your event: 1. Set a date: Give yourself at least four months of planning/preparation time. 2. Secure the facility early: You will need an auditorium of large meeting room plus several classrooms for testing. Plan on conducting four or five tests. If you anticipate 100 people, you could put 20 people in each of five rooms. For 200 participants, I would recommend doubling the stations. (You will have duplicate testing sites for each experiment.) 3. Decide upon the crime or theme for the evening. One year we used the disappearance of our principal s Gator helmet and this year we based the evening on the board game Clue. 4. Recruit suspects and victim(s). Try to get a variety of individuals who are outgoing, can be dramatic, and are known by the target audience. Select from teachers, administration, and the student body. The more into the character your suspects are, the better the reaction from the participants. 5. Enlist help from TV Productions & Criminal Justice: The TV Productions students have been fantastic to us. They film our suspects and directions for the evening, then edit the footage to present us with a professional video. The Criminal justice students gather the evidence from the crime scene and then have a trial for the defendant. 2 6. Determine the tests to be conducted. You need to plan ahead what types of tests you will have the participants perform on the evidence. You must have this information before setting the crime scene in order to be able to collect the appropriate evidence from the scene. Plan for each test to be completed in minutes. Suggestions: Mysterious powder (use corn starch) Ransom note Fingerprints Footprints Blood Soil Hair Cloth fibers 7. 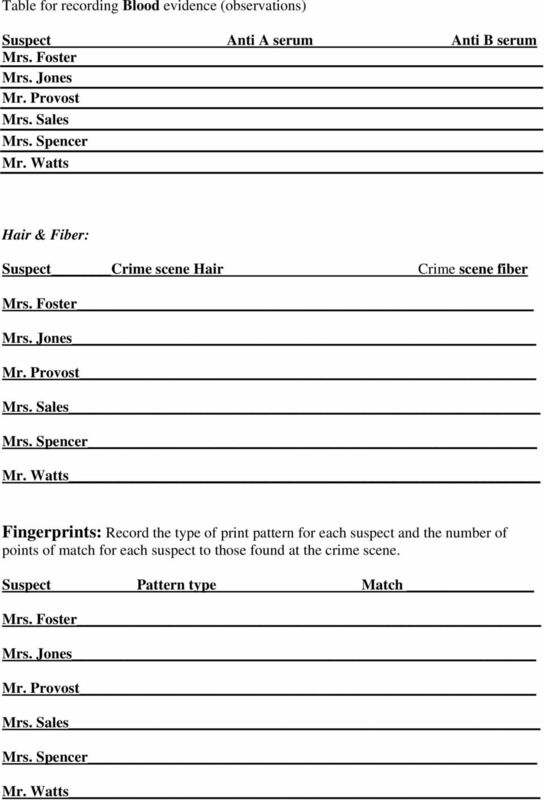 Create tables to record the evidence. 8. 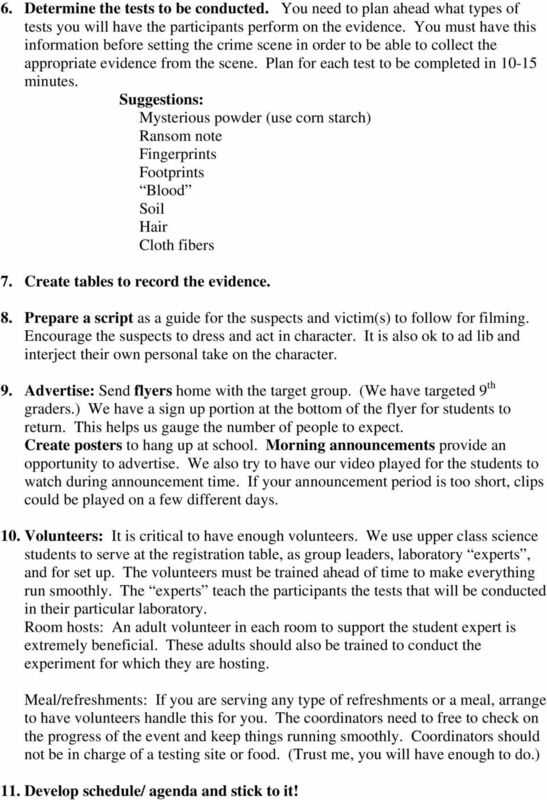 Prepare a script as a guide for the suspects and victim(s) to follow for filming. Encourage the suspects to dress and act in character. It is also ok to ad lib and interject their own personal take on the character. 9. Advertise: Send flyers home with the target group. (We have targeted 9 th graders.) We have a sign up portion at the bottom of the flyer for students to return. This helps us gauge the number of people to expect. Create posters to hang up at school. Morning announcements provide an opportunity to advertise. We also try to have our video played for the students to watch during announcement time. If your announcement period is too short, clips could be played on a few different days. 10. Volunteers: It is critical to have enough volunteers. We use upper class science students to serve at the registration table, as group leaders, laboratory experts, and for set up. The volunteers must be trained ahead of time to make everything run smoothly. The experts teach the participants the tests that will be conducted in their particular laboratory. Room hosts: An adult volunteer in each room to support the student expert is extremely beneficial. These adults should also be trained to conduct the experiment for which they are hosting. Meal/refreshments: If you are serving any type of refreshments or a meal, arrange to have volunteers handle this for you. The coordinators need to free to check on the progress of the event and keep things running smoothly. Coordinators should not be in charge of a testing site or food. (Trust me, you will have enough to do.) 11. Develop schedule/ agenda and stick to it! 3 12. Make copies in advance: Prepare all of your information and tables well in advance to avoid last minute issues. Print extras!!! 13. Secure AV equipment: Be sure that you have the equipment needed and that you are comfortable with running the equipment. It is advisable to have a PA system available. 14. Involve your administration!! Good Luck and Have Fun!! 8 Summary: Place an X in the space next to the suspects that matched evidence listed in the table below. Indicate where the fingerprints were located. For the pen used for ransom note indicate the person whose fingerprints were found on the pen at the scene that matched the ink type used on the ransom note. Pen used Suspect Fiber Hair Footprint Fingerprint Blood writing DNA ransom Mrs. Foster Mrs. Jones Mr. Provost Mrs. Sales Mrs. Spencer Mr. Watts Based upon the test results and analysis of evidence, it appears that removed the helmet from Ms. Quelland s office and attempted to collect ransom money. 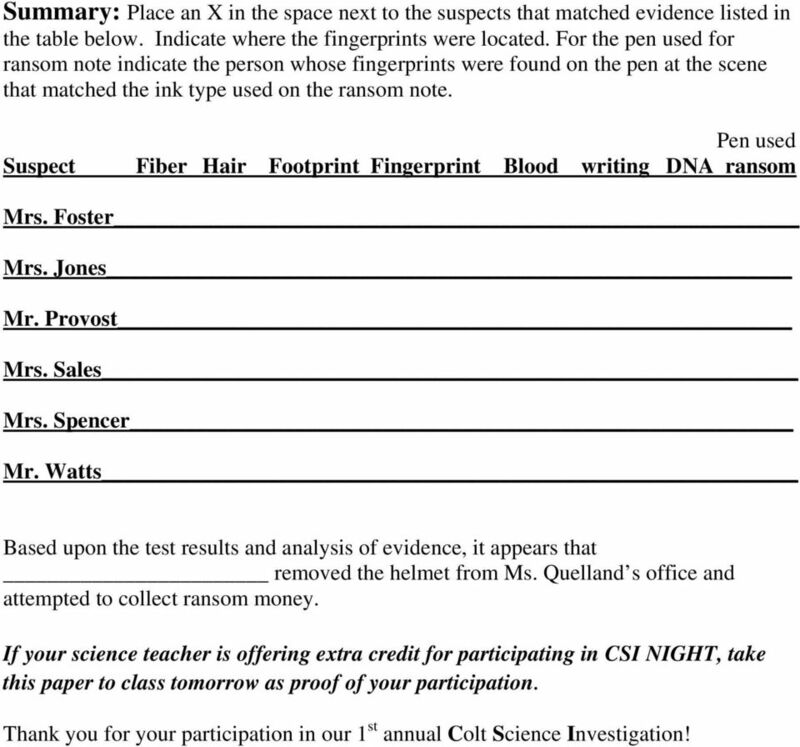 If your science teacher is offering extra credit for participating in CSI NIGHT, take this paper to class tomorrow as proof of your participation. Thank you for your participation in our 1 st annual Colt Science Investigation! This activity will help the Bear Scout learn about being observant, looking for clues, and solving situations with those clues. Starting a Booktalk Club: Success in Just 12 Weeks! ORGANISING A FASHION SHOW: some hints & tips.